I don't think this movie is as good as the first one, but it is still enjoyable. The plot is ok, though it could have been a bit stronger. Things seem to pick up right after the end of the first movie with James going back to Hong Kong with Lee for a vacation. Lee doesn't bother to share that he's trying to work on a case. The basic formula used for the first movie is used again, just with James and Lee in opposite roles for the most part. James is definitely out of place in Hong Kong. That does add some humor to a few scenes, but not all of it works because of how over the top he goes. The action is the same type that was used in the first movie. It is done well and entertaining. The action does add a bit of violence, though it isn't extreme. The characters are fine for the most part, though James is annoying at times. Chris Tucker can be funny, but he frequently crosses the line into annoying in this one. He does too much yelling. Jackie Chan does fine with his part. My DVD has all sorts of extras on it, some of which can be accessed while watching the movie if a certain option is picked. It has been a while since I watched any of them, though I think I remember some of them being interesting. 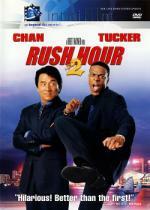 Rush Hour 2 has some issues and could have been better, but it manages to be mostly entertaining. People who liked the first one may find something to like in this one.